Carter Hart Shows That He's the Real Deal - The Point Data-driven hockey storytelling that gets right to the point. Considered to be a bottom-feeder team after their horrid start, the Philadelphia Flyers have rattled off eight straight wins and brought themselves back from the brink. 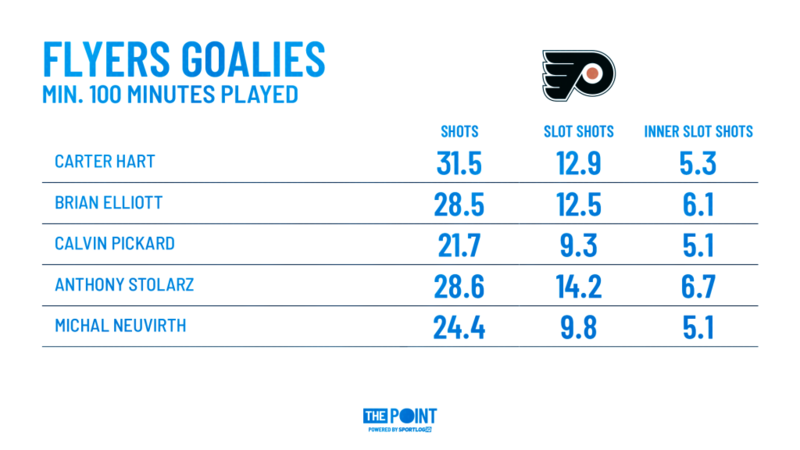 A big part of their turnaround has been the stellar play of Carter Hart who’s showing what the Flyers can do with consistent play in their crease. When Carter Hart was called up on December 17th, the Flyers seemed all but certain to miss the playoffs. They were dead last in the Eastern Conference and Hart was set to be their 7th starting goalie on the year, tying an NHL record. Injuries and inconsistent play forced the Flyers to call Hart up to the big club, likely before they would have liked. Sixteen starts and a seven-game win streak later, it’s fair to say the NHL spotlight hasn’t phased him. Just last night, he posted a career-high 10 saves from the most high-danger area on the ice, the inner slot. And if you think the Flyers have tightened up in front of their rookie goaltender, think again. Of the five Philly goalies to start more than two games (sorry Mike McKenna and Alex Lyon), Carter Hart is the only one who has faced over 30 shots a game. And these 30+ shots aren’t just easy looks from the outside, as he’s also faced the second most shots from the slot on the team. Despite that, Hart still owns the teams best save percentage by a good margin. It becomes pretty clear that Hart is a game changer for this team. There hasn’t been some miracle defensive strategy implemented that’s allowed him to do so well. He’s just proven game after game that he’s ready to be the starter. Hart’s putting together a tremendous start to his career, giving Flyers fans something to hope for in the future. If Philly can fight all the way back to a playoff berth, it’ll be on the back of Hart. He continues to find ways to impress every night just like this save he made last night. There’s no doubt the Flyers are excited to finally have a true number one and Hart looks to be the real deal.